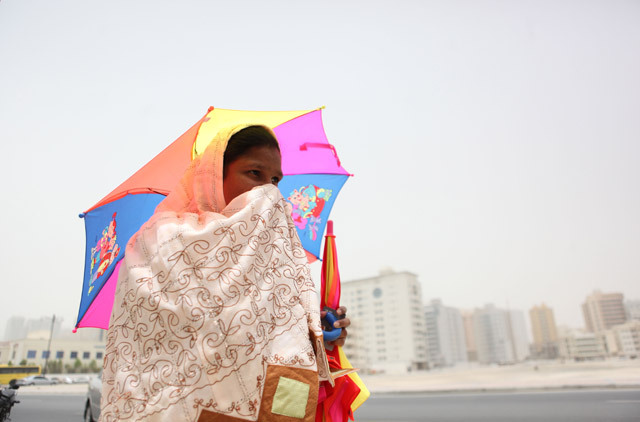 Dubai: The weather in the UAE is expected to become a lot cooler over the next two days before rising once again by the end of the week. The National Centre of Meteorology (NCM) said the weather on Tuesday and Wednesday will be dusty and cloudy with a chance of light rainfall at night over the coast and islands, as well as in the Western Region, which will also be accompanied with a significant decline in temperatures. “Moderate northeasterly to easterly winds will blow dust and sand across exposed areas, with a speed of 20-30 km/h. Strong winds over the sea will blow up to 55 km/h, which will bring waves to reach as high as 8 feet offshore,” said the NCM. The minimum temperature on Tuesday ranged from 20-24 °C in coastal and island areas, 19-23 °C in internal areas and 14-18 °C in the mountain region. The respite from high temperatures is not expected to last for long however, as the NCM reported that the weather will become warmer by Thursday, although sporadic rainfall is likely to affect some coastal areas. Dust and sand clouds will also affect various parts of the country, and strong 40 km/h winds will continue into Friday morning.